The personal portfolio for our very own April Dawn Kester was built in Divi 2.0, a full-width responsive theme from Elegant Themes. We’ve built a few sites now in Divi and have found the modular page-builder framework offers a great deal of flexibility in presentation, particularly with portfolio websites like this. Notice the streamlined resume on the home page. The tabbed format simplifies even the most technical resume. The easier the information is to digest, the more likely the audience keeps reading. You just can’t put a value on that in today’s competitive job market. On the portfolio page, you’ll find a slideshow of our web designs, presented in a different format than here on Belle Jackson Design. 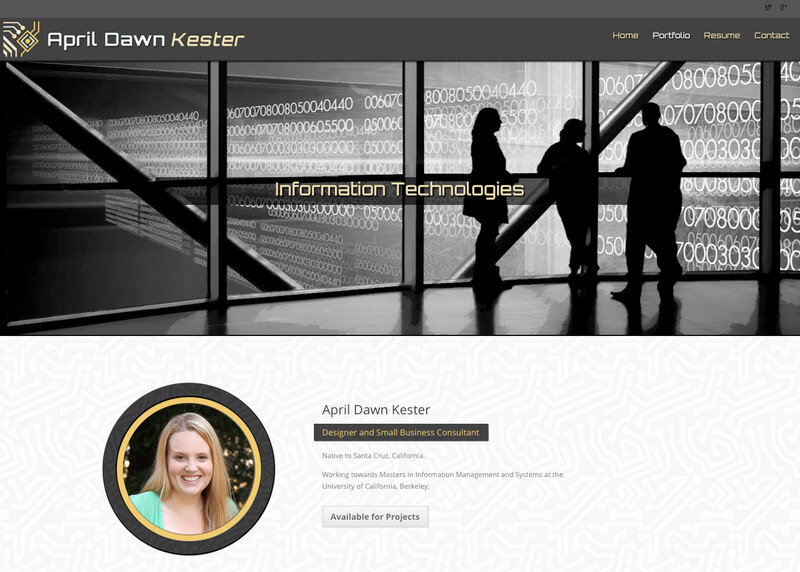 We’ve also showcased April Dawn’s academic portfolio, featuring some of her case studies, term papers, and project presentations. There’s a lot of content presented in a small space, but it’s never overwhelming. What do you think about this high impact personal branding? It’s a new design package we’re offering at an introductory price of $175. Drop us a line and let us know!